Conservative gold preps that wear well and typically last longer in the mouth than composite or amalgam materials. 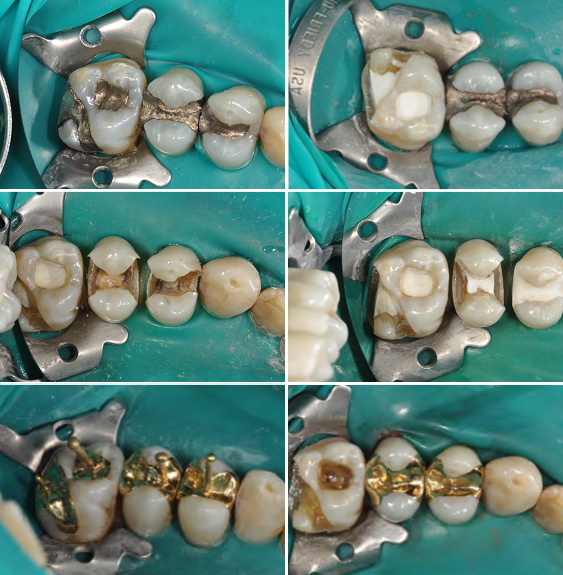 Gold is much more fracture resistant than porcelain restorations. Tucker technique gold restorations are considered the "Golden Standard of Dentistry". Yes, we live in fast times and a very media generated world, but one thing has not changed and that no dental restoration has yet surpassed the high standard set by gold. Esthetics are very important today, however, not everything should be driven esthetically, and not every patient desires esthetics over function. The Academy of Richard V. Tucker Study Clubs is dedicated to providing education for those dentists seeking the highest level of training and expertise in restoring teeth with the most conservative, long lasting conservative cast gold restorations. The conservative approach leads to very esthetic restorations that show little if any gold while still being durable and exceptionally well-sealed. Please check out our web site for literature that supports the rationale for gold. Please visit www.arvtsc.org for more information about the clubs around the world!